SANTA CLARITA, CALIF. (January 25, 2016) — The Remote Lamp Mount (RLM) Small Systems (S/S) ultraviolet (UV-C) lamp fixture kit from UV Resources delivers ultraviolet energy to destroy coil/drain pan microbial infestations and disinfect moving air streams in hard-to-service fan coil units, package (PTAC) units and heat pump systems. By inactivating these microbes, the UV small systems kit helps prevent coil inefficiencies, drain pan overflow and foul odors. Designed for smaller HVAC equipment, the kit combines name-brand UV-C components in a simple, flexible and affordable design. Among its features is a state-of-the-art CU2™ for local or remote lamp/ballast monitoring and several convenient power knock-outs for ease-of-wiring from within, or outside, the equipment it is serving. Remote power supply. 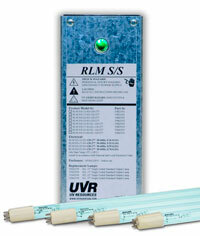 Installers can locate the RLM S/S Kit’s 120-277, UL Listed, fully PnP power supplies remotely. A heavy-gauge galvanized steel and NEMA-rated power supply housing. The state-of-the-art CU2™ sensor provides visual LED and analog output methods of verifying lamp and ballast on/off operation. A five-year power supply warranty. The UV Resources RLM Small Systems (S/S) Ultraviolet Lamp Kit delivers ultraviolet energy to destroy coil/drain pan microbial infestations and disinfect moving air streams in hard-to-service fan coil units, package PTAC units and heat pump systems. Designed for smaller HVAC equipment in both new and retrofit applications, the RLM S/S generates 360-degree UV-C irradiation and is available in 12-, 17-, 22- and 33-inch lamp lengths. Fixtures are UL Listed and carry a five-year warranty and a one-year warranty on lamps. UV Resources (UVR) is a leader in the education, design and innovative engineering of affordable ultraviolet-C equipment for a variety of commercial, healthcare, government and residential HVACR applications. 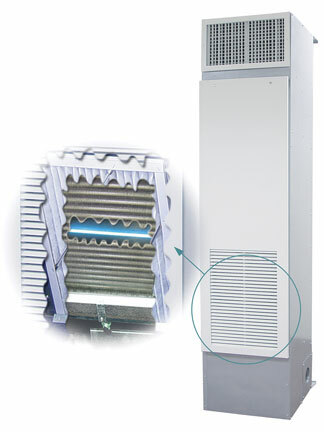 In addition to developing new and unique UV products for specific applications, UVR team members were among the first to properly apply UV energy in air conveyance systems of all types. UVR is an active member of ASHRAE, Illuminating Engineering Society (IES) and the International Ultraviolet Association (IUVA). For more information, call 877-884-4822; or visit http://www.UVResources.com. Designed for smaller HVAC equipment, the Remote Lamp Mount (RLM) Small Systems (S/S) ultraviolet (UV-C) lamp fixture kit from UV Resources combines name-brand UV-C components in a simple, flexible and affordable design. Easy and flexible to specify, install and service, the Remote Lamp Mount (RLM) Small Systems (S/S) ultraviolet (UV-C) lamp fixture kit from UV Resources is mounted remotely from the lamp making the complete install simple, quick and near fail-safe. 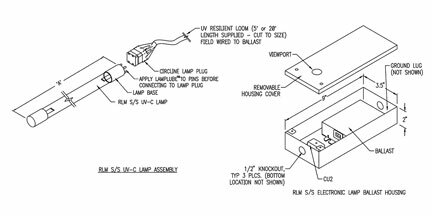 Lamp holding and locating mechanisms simplify lamp positioning and securing for the Remote Lamp Mount (RLM) Small Systems (S/S) ultraviolet (UV-C) lamp fixture kit from UV Resources.